Bronze artist David Dirrim and granite artist William Yates, both Colorado natives, were selected in 1998 to create the Pueblo Medal of Honor Memorial outside the Convention Center on Heroes Plaza. In addition to the statues of Pueblo’s four heroes the names of the over 3,400 recipients were incorporated on granite slabs mounted on the walls of the Convention Center just behind the sculptures. Listed by war, the names are in alphabetical order. The granite block on which each sculpture sits has a citation as well as a map of where their action took place, plus other awards they wished listed. It is important to note that each of the recipients depicted spent time working with Dirrim at his foundry to assure that the uniforms and equipment included in the sculptures was accurate. En route to his first tour in Vietnam, Staff Sergeant Drew Dix was pulled off his beloved special forces A-team and reassigned to the Central Intelligence Agency. As the lone American, Dix was assigned to lead the Provincial Reconnaissance Unit, an armed force of local mercenaries, to fight the communist aggression. The Dix story begins during the Tet Offensive of 1968. Although outnumbered at least thirty to one, Dix lead a small contingent of troops in a harrowing fifty-six hour battle against two Viet Cong battalions. The action earned Dix the Medal of Honor. Determined to rescue the civilians and restore Chau Doc, Dix took matters into his own hands. He saved a young US nurse, eight USAID volunteers, two Filipino workers, a young Vietnamese girl and the wife and children of the Province Chief. Acting alone, Dix assaulted enemy strongholds, secured key buildings and captured over twenty prisoners including a General Officer who turned out to be one of the highest ranking officials ever seized during the Vietnam War. Drew Dix is the first enlisted Green Beret to have been awarded the Medal of Honor. He received a direct commission to first Lieutenant and retired as a major after twenty years in the Army. Today in the fight against terrorism, his years of experience in special operations and unconventional assignments are being utilized to serve our country in the area of Homeland Security. You will note that Sqt. Dix is holding and wearing some unusual weapons. Because he was with Special Forces he was permitted to use weapons of his choice. The submachine gun is a Karl Gustav or Swedish K. The side arm is a Buntline Special with a 12 inch barrel. He acquired it when a friend asked if he could have the Barretta Dix had never used and insisted that Dix take the Buntline in trade. He first wore it as a lark to a day of target practice and was such a dead shot with it at 100 yards that his Vietnamese troops insisted that he carry it from then on. At a young age Bill Crawford learned to defend himself by boxing. As a soldier during World War II his fighting skills were put to the ultimate test. Crawford’s path to the Medal of Honor began in 1943 in Italy. As the company scout, Army Private Crawford discovered three hidden German machine gun nests. Alone and unable to alert his fellow soldiers of the awaiting ambush – Crawford took matters into his own hands. He single handedly engaged the enemy – with only his rifle and grenades he destroyed all three enemy emplacements. As his company advanced, he volunteered to stay behind to aid a wounded friend only to be captured by enemy troops. As a POW, Crawford endured nineteen months in a Nazi prison camp. His hometown golden gloves experience came to the surface when he was put to the test and knocked out a Nazi guard during a fight. Back home his family had presumed Crawford was killed in action and his Medal of Honor was presented to his father posthumously. In 1945 his family rejoiced in his liberation from Germany and he returned to Colorado living a very humble life. After his Army retirement Crawford took a job as a custodian at the Air Force Academy and took on a special role befriending and mentoring the young cadets. One former cadet, now an Air Force Colonel has written “The Janitor’s Ten Lessons In Leadership” now a mandatory reading for the entire Air Force. It wasn’t until over forty years after his heroic action that Crawford was presented the Medal of Honor in person. He was officially presented the medal by President Ronald Reagan at the 1985 Air Force Academy graduation ceremony. The uniform worn by Bill is typical GI issue used by troops in Africa and Italy. He was in the Texas 38th Infantry Division which landed at Salerno.Â The small shovel on his back was used to dig fox holes. In addition to the long bayonet on his M-1 rifle, he carried a number of hand grenades and an extra cartridge belt. In the winter of 1950 General Douglas MacArthur declared “the troops will be home by Christmas, but unknown to the US Commander, the First Marine Division was being surrounded by over 120,000 Chinese troops. On November 29th at the Chosin Reservoir in North Korea Captain Carl Sitter received his fateful orders to take East Hill. In unbearably frigid sixty below zero conditions Sitter and his men of George Company headed up East Hill. Out numbered at least twenty to one they were engaged by the ferocious Chinese troops for three nights – many times in hand to hand combat. During the brutal battle Sitter remembers feeling as though he was protected by an invisible shield. He gallantly executed his orders and today his heroic leadership is legendary in the annals of Marine Corps history. The navy parka, scarf and mittens worn by Captain Sitter were typical attire for soldiers trying to keep warm in the Northern part of Korea at Chosin Reservoir, the site of his Medal action. He wore a Colt .45 in a shoulder holster because he had done so during WWII and it had deflected a bullet and most likely saved his life. Operation Clambake was a detailed, well-planned raid for the Ungok hill mass in Korea. However, the cold February day of 1953 turned grim very quickly as the 1st and 2nd Marine platoons of Able Company began their assault. 2nd Lieutenant Raymond “Jerry” Murphy was the 3rd platoon leader with the assignment of evacuation. As the raid progressed, Lieutenant Murphy became uneasy and felt his fellow Marines might be in trouble. Defying direct orders, Murphy led a small group of men up the hill to assess the situation. It was as he suspected. The assault had stalled and most of the senior officers and NCOs had been killed. Knowing the raid had failed, Murphy organized and led a heroic rescue effort. Under intense enemy fire Murphy made countless runs up the hill on a mission to save lives. As the other men pulled back Murphy provided cover and while maneuvering across the hillside stalking the enemy to protect further casualties. Only after he was sure all the Marines were accounted for – would he leave the battlefield. Murphy sustained numerous wounds but refused treatment until everyone else had been treated. Upon presenting Murphy the Medal of Honor President Eisenhower was quoted as saying “What is it in the water out there in Pueblo, all you guys turn out to be heroes.” In his final years this hero was still protecting his fellow Veterans by volunteering at the VA hospital in Albuquerque. His heart was devoted to protecting others and aiding those in need. Lt. Murphy is standing partially on sandbags, one of which is leaking sand from a bullet hole. The area where his MOH action took place was the side of a hill where there were a number of dug-out emplacements that were fortified with sandbags. The heavy parka and gloves were necessary due to the extreme cold of the Korean winters, some were the coldest on record during the years of 1950 to 1953. Bill Crawford and Carl Sitter died in 2000, shortly before the unveiling of their statues. Mr. Crawford is buried at the Air Force Academy and Mr. Sitter at Arlington National Cemetery. Jerry Murphy passed away in 2007 and is buried at the Santa Fe, NM National Veteran’s Cemetery. Drew Dix is retired and living on a ranch in New Mexico. 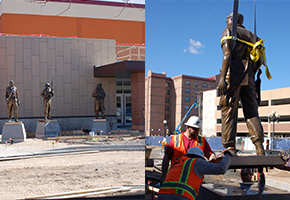 The Pueblo Medal of Honor Memorial, seen in the photo above, was removed in late September of 2017 and put in storage during the expansion project of the Pueblo Convention Center. A new nearby location was designed and planned for the Memorial so that it could be reinstalled sometime in 2019. The expansion construction is now nearing completion and components of the Memorial are now being set in their new home. The photographs below show the beginning of that process as the statues are reset on their bases in early March 2019. A rededication of the Pueblo Home of Heroes Memorial will take place on Saturday, May 11th at 10:00am. The Medal of Honor is the highest award for valor in action against an enemy force which can be bestowed upon an individual serving in the Armed Services of the United States. Generally presented to its recipient by the President of the United States of America in the name of Congress, it is often called the Congressional Medal of Honor. The Pueblo Home of Heroes Association was first known as Pueblo Medal of Honor Foundation. It was created after Pueblo Chieftain newspaper publisher Bob Rawlings decided to fund raise to create a Medal of Honor memorial in Pueblo, Colorado to honor Pueblo's four Medal of Honor recipients. The project was to be four individual statues with additional names of all Medal of Honor recipients included. As the memorial project progressed, the Foundation was created from a committee of citizens. The group decided to invite the Congressional Medal of Honor Society to Pueblo for their national annual convention in the year 2000, so they could be a part of the unveiling. The Congressional Medal of Honor Society is made up exclusively of all living Medal of Honor recipients. After completion of the Pueblo Memorial and the hosting of the Convention, the committee reorganized to maintain the Memorial and promote it as an attraction in Pueblo, Colorado.